Friction In The Eagle’s Locker Room ? 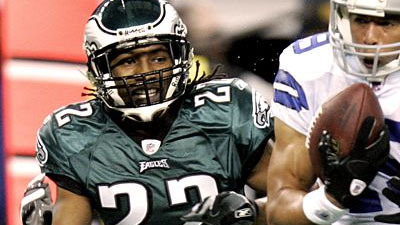 Philadelphia Eagles CB Asante Samuel don’t like the way the team’s front office is handling their business. He is of the belief that a “couple people upstairs might not” want him. Those people that he is referring to are GM Howie Roseman and President Joe Banner. Jay Glazer of Fox Sports is reporting that New Orleans Saints starting WR Marques Colston will be out at least 4 weeks due to a broken collarbone. The injury was sustained in the NFL opening game against the Packers. 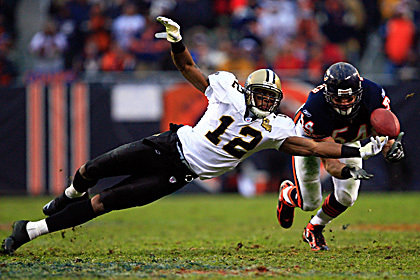 Colston caught 6 passes for a total of 81 yards. His presences would be missed, maybe not as much since the Saints like to spread it around. With the help of FOXSports we are previewing the college football season. This preview looks at week one biggest games. LSU vs Oregon and Boise State vs Georgia. Mark Richt talks about being ready to face Boise State. FoxSports Sam Rosen and Chad Pennington takes a minute to discuss a few quarterbacks to watch in the NFL. Their list include Jay Cutler, Cam Newton, and Kevin Kolb. President Obama talks about the NFL Labor dispute with the NFL players and owners. What is the NFL Labor Dispute All About ? Fox Sports helps us understand what the NFL labor situation is all about. Jeff Benz explains just what the labor dispute between players and owners is all about. Excusive video from Fox Sports. The roof at the Vikings Metrodome in Minnesota collapsed because of heavy snow fall. This video is amazing. The NFL has rescheduled the game for Monday night in Detroit.